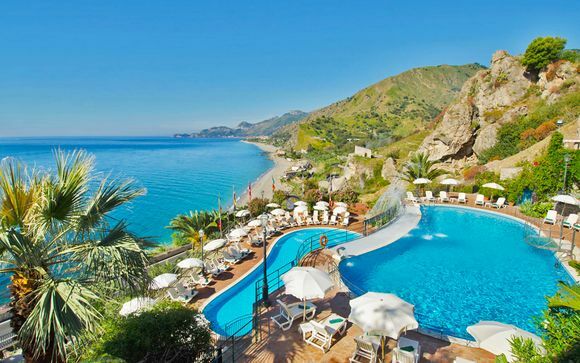 Sicily Vacation Guide up to -70% off To take advantage of these offers, join now for free! Explore Sicily with our travel guide ️ Where to go out with family or friends, places to visit... The expert advice from voyage-prive.co.uk. 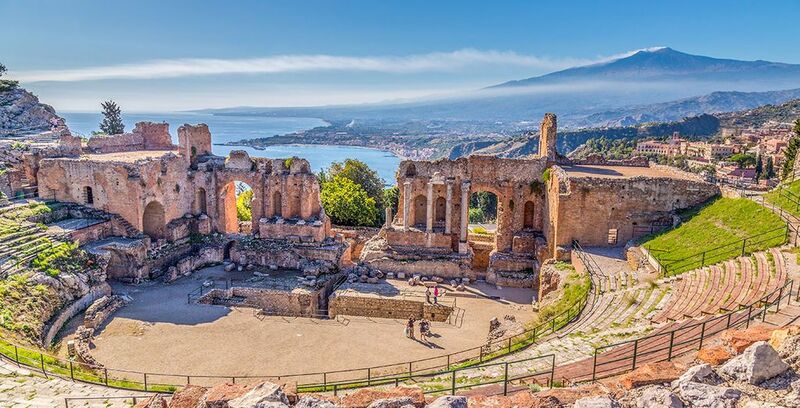 Sicily’s dramatic landscape is truly enticing, from the peak of Mount Etna to the sapphire seas at Palermo, this amazing island has something for everyone. While on holiday here, you can explore the ancient sites in this fascinating melting pot of Mediterranean and Byzantine culture. You can hike in the beautiful mountain scenery, or take a dip in the sparkling ocean. 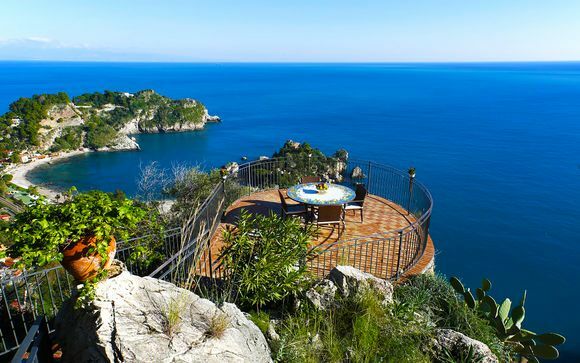 Located at the tip of Italy’s “boot”, Sicily is a place of romance, adventure and relaxation. Greek temples, Arab domes and European churches sit side by side, and Sicilians are famous for their warm welcome and are happy to share the foodie delights of the island with you. Bite into a local pastry, sample juicy red oranges and taste artisan cheeses - you’ll never want to leave. Start at Palermo, Sicily’s vibrant capital. The old and the new sit side by side here. The impressive cathedral is a must-see, as well as the grand 9th century Palazzo dei Normanni. You can get lost in the markets and winding streets, or treat yourself to a meal at one of the best restaurants in the country. 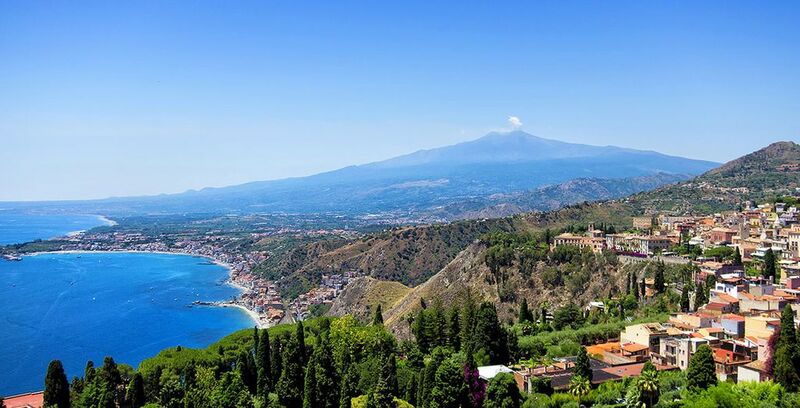 Perched at the base of Mount Etna, this pretty town has plenty to offer. It was almost totally destroyed by a massive eruption in 1669 but has since been restored to its former splendour. The city centre is UNESCO listed, with incredible baroque buildings at every turn. Many of the buildings are made out of lava, including the 2nd-century Roman amphitheatre. If you’re in search of excitement, a trip to Europe’s largest active volcano should be on your list. A winter visit could involve skiing down the volcano’s slopes, whereas summer allows pleasant hikes in the woods. There is also a cable car service which reaches a height of 3000m for some fantastic views. This coastal city offers a glimpse into Ancient Greek history. It was once the biggest city in the Greek empire. Now you can see remarkable ruins, such as the amphitheatre and the Temple of Apollo. Once you’ve had your fill of culture, sit down and have a drink in the beautiful Piazza Duomo, or visit the colourful Ortygia market. This is a fascinating archaeological site outside Agrigento which holds the remains of eight temples. They date from the 5th - 6th century BC and together they form the largest archaeological park on the planet. As you stroll through the columns of the well-preserved Temple of Concordia, you may well feel like you’ve travelled back in time. Mount Etna has blessed Sicily with nutrient-rich, geothermal waters. Thermal baths have been popular since Roman times, and there are plenty of places where you can still enjoy a dip. Locals enjoy the small island of Vulcano, where there are both mud baths and hot thermal baths. Taking to the waters or having a natural mud bath here works wonders for the skin. The whole island is surrounded by crystal clear waters and lovely beaches. Modello beach is a firm favourite with families, because of its shallow waters. Fontaine beach is another excellent choice for sunbathing and swimming. Divers will love the marine reserve off the island of Ustica, which is suitable for beginners and experienced divers alike. To get away from the crowds, take a cable car to the Isola Bella coastal nature reserve. There are plenty of hiking trails, from leisurely coastal wanders to mountain treks. The Vendicari Reserve has paths taking in seaside views and archaeological sites. Keen hikers will enjoy the volcanic treks available around Etna, while casual walkers will enjoy the short walk up La Rocca. Wherever you choose to stroll, the views are spectacular. Sicily is the ultimate food destination. Fresh produce is everywhere, from olive oil to seafood. One of the most famous dishes is cannoli - a sweet pastry filled with creamy ricotta cheese. Other specialities to look out for are arancini and caponata. If you fancy a tipple, local wines are becoming increasingly popular. Finish with a sweet limoncello liqueur. 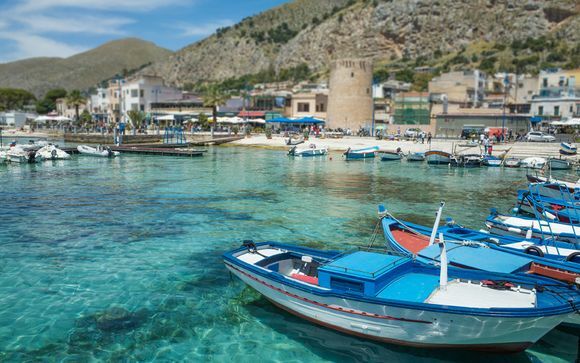 A string of seven UNESCO protected islands off the North coast of Sicily, these are well worth a day trip. Swim in sparkling seas, try your hand at water sports or even take a dive. Why not go on a wine tour, and sample the local Malvasia wine, or visit the active Stromboli volcano? At the end of a busy day, eat a fantastic Sicilian feast while watching the sun go down over the Mediterranean Sea. Sicily’s peak season is July and August. The weather is hot, with highs of 28°C, but this is accompanied by higher prices and crowds. A trip in September is quieter and should ensure warm seas and pleasant temperatures. Spring can be an ideal time to travel to Sicily. You'll find comfortable temperatures and shoulder-season prices. Winter can be cool, with lows of 8°C and highs of 13°C. Winter also has lower prices and no crowds to contend with. Sicily’s four main airports are Palermo, Catania, Trapani and Comiso. They are served by both low-cost and commercial airlines. A flight from London takes around three hours, while Madrid is a 1 hour and 45-minute flight away, and Rome is 1 hour and 15 minutes away. Many visitors arrive by ferry from Italy, as there are several connections available. You can even take a direct train from Rome or Naples, travelling in air-conditioned carriages. All visitors must carry a valid passport, but EU citizens do not need a visa to enter Italy. Nationals of the USA, Canada and Australia, as well as some others, can have a visa-free stay of up to 90 days. Other citizens will need to apply for a Schengen visa before leaving home. 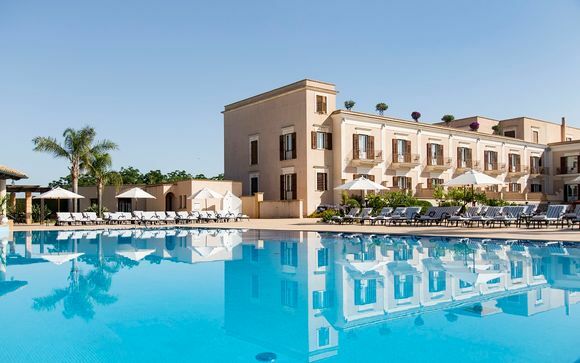 Have a luxury seafront escape at the Domina Zagarella Sicily 4* hotel. Located 30 minutes from Palermo, there is culture on your doorstep and stunning scenery all around. 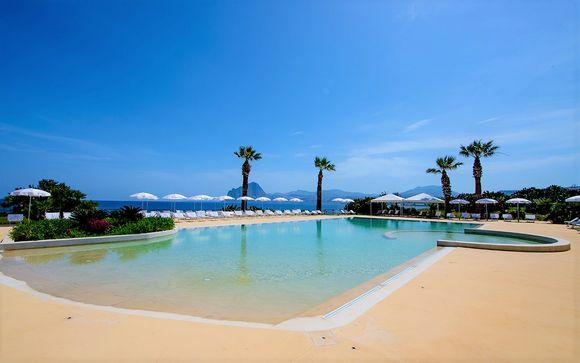 Discover the 5* Verdura Resort and enjoy the fabulous golf and spa facilities available. Relax on the private beach, or take in nearby attractions such as the Valley of the Temples. 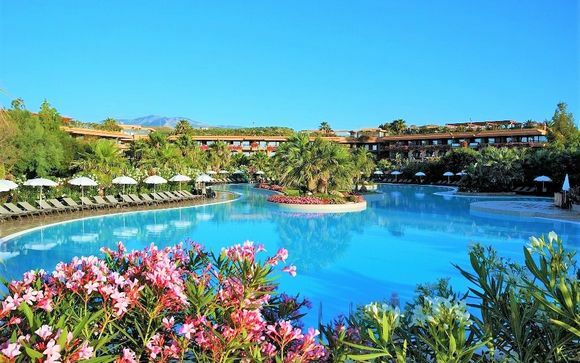 Savour seclusion at the Venus Sea Garden Resort 4*. 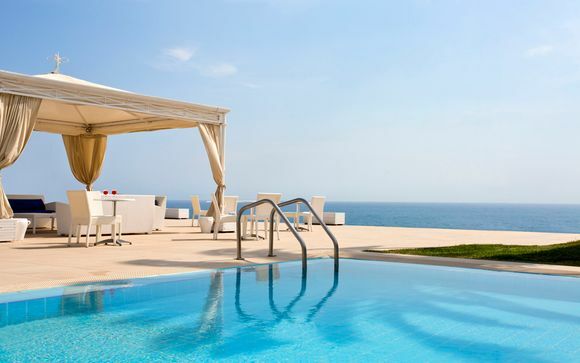 The sunny terraces and pool overlook the gorgeous Mediterranean coastline. The nearby village of Brucoli is a traditional fishing community full of history and culture. For a stress-free trip, why not choose a 7-day fly and drive tour. You'll take in plenty of sights and stay in comfortable 4* accommodation throughout. Cheese fans will love the annual Ricotta festival, held in Vizzini on April 25th. As well as fresh local produce, there is music and traditional entertainment throughout this three-day event. If you’re a culture vulture, the Teatro Greco should be right up your street. Held every spring in Syracuse’s ancient amphitheatre, it showcases classical Greek theatre. One of Sicily’s most loved exports is celebrated at the Sagra dell’Olio in Furnari every July. Local olives takes centre stage in dishes such a bruschetta and fresh olive oil. Live music makes this festival a jolly affair. Dress modestly when visiting religious sites such as churches or monasteries. Ensure your shoulders and upper legs are covered. Greet locals in a friendly way by saying “Buongiorno” (good day) or “Buona sera” (good evening). Most shopkeepers will say hello and greet customers as they enter a shop. A smile and polite greeting in return is always welcomed. Handmade Etna lava stone products are sold all over the island. It is made into jewellery, vases, pots and even souvenir magnets. Lava stone items make unique gifts or keepsakes. Local produce is another great choice to take home. Relive memories of your trip when you open a bottle of Sicilian wine or olive oil on your return. Like the rest of Italy, Sicily uses the Euro. ATMs are widely available and many hotels and restaurants accept major credit and debit cards such as Visa and Mastercard. Smaller cafes and boutiques may not accept card payments, so it is a good idea to carry some cash as well. Sicily is part of the Central European timezone, which means it is one hour ahead of London and GMT. What language is spoken in Sicily? Italian is spoken throughout Sicily. Locals also speak the Sicilian language and regional dialects. Hiring a car will make getting around Sicily easier, although there is also a reliable bus network. To hire a car you will need to be over 21 and carry your driving licence at all times. Roads are generally in good condition. Some rural roads can be difficult to navigate. Fuel is widely available. Many visitors also use the ferry network to explore Sicily and its neighbouring islands. Services run regularly during peak seasons, but ferries are less reliable in winter and can be disrupted by weather conditions. The climate is warm for most months of the year. Visitors in the winter and spring may want to bring some warmer layers. You will need sunscreen and a sunhat, and make sure to bring some sturdy shoes for hiking or exploring historical sites. A round two-pin electrical adapter will ensure all your gadgets can be charged up. A seven-day trip is enough to take in many world heritage sites, from Syracuse to Agrigento. A ten-day itinerary covers the prettiest beaches and stretches of coast on offer. 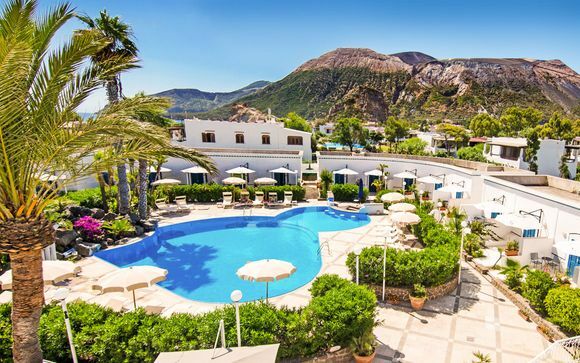 A shorter trip could involve a weekend break in Palermo, a hiking trip in the mountains, or a relaxing spa holiday amidst beautiful scenery. There is a huge variety of restaurants, cafes and even street stalls to choose from. Trattorias are often family-run and serve a wide range of local dishes. An osteria is a relaxed wine-bar style restaurant serving small plates and antipasti. Popular dishes include busiate all Siciliana, pasta alla Norma and caponata. Don’t miss local sweet treats either, from granita and gelato to almond pastries and candied fruits. 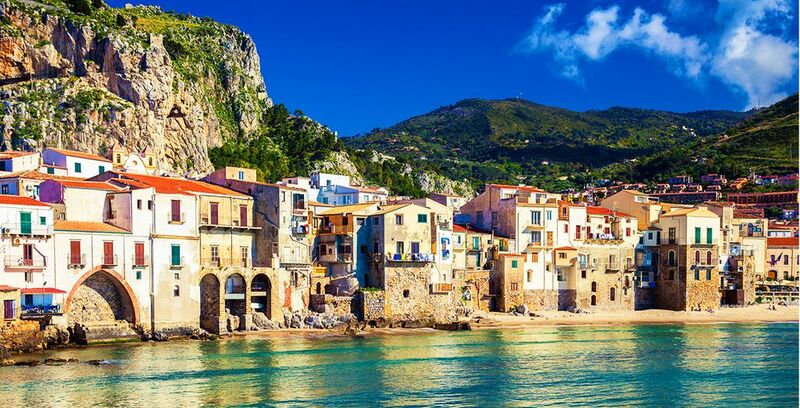 Many of the beaches offer family-friendly shallow waters, such as the long sandy stretch at Cefalù. One traditional form of entertainment is a puppet show, which is sure to delight little ones. 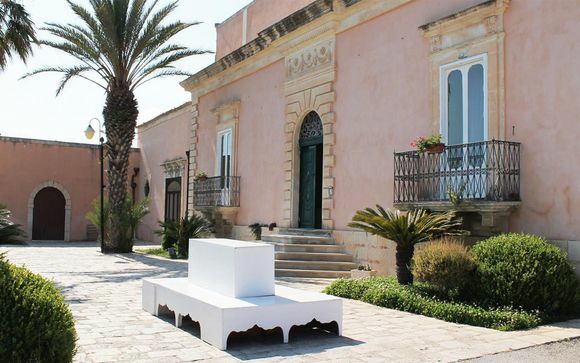 Sicily: What budget to plan? Street food will cost you around €5-10, while a cheap meal of pizza or pasta will be €10-15. Dinner in a mid-range restaurant costs between €30-60. Local bus or train tickets are reasonable, around €5-10. If you hire a car, fuel is around €1.50 per litre. Souvenirs can be cheap, and gentle haggling is acceptable in outdoor markets. Sicily is home to an active volcano, and the landscape is as dramatic as you’d expect. 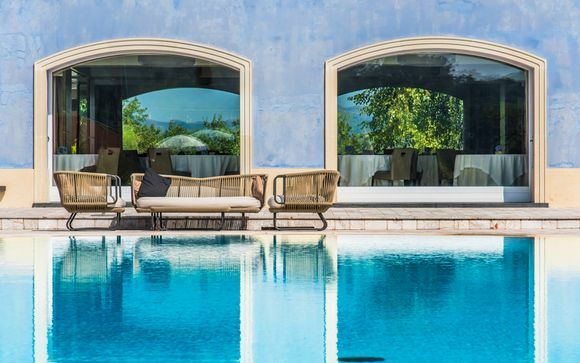 From the slopes of Mount Etna, rugged mountains sweep down to gentle hills and citrus groves. The coast is full of pretty coves and lovely beaches that are waiting to be explored. Most restaurants have a cover charge, but if it is not included on your bill consider rounding it up for a tip. It is usual to leave small change when ordering a drink and to round up to the nearest euro when paying for a taxi. Italians like to look nice. Shorts and t-shirts are acceptable for the beach but don’t wear skinny clothes or bikinis while walking around towns or villages. Smart casual wear is appropriate for dinner. 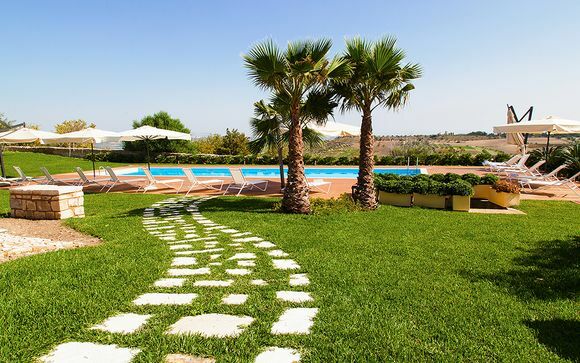 Discover our offers to Sicily : Stays, holidays, great deals, last minute deals. Discover our offers to Palermo : Stays, holidays.